Wayne State University Press, 9780814333815, 114pp. In Line for the Exterminator is the final collection in Jim Daniels's trilogy of books explaining the urban working-class landscape. Daniels, who grew up near the Eight Mile Road boundary between Detroit and suburban Warren, Michigan, walks the razor's edge of the borderline in this collection, examining complex issues of race and class that are a part of daily life there. 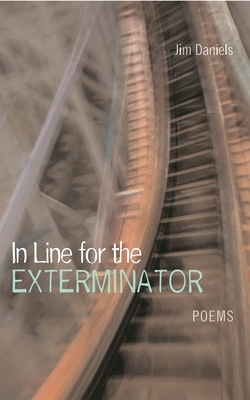 The title poem, "In Line for the Exterminator," sets the ironic tone for this collection, examining a group of people waiting in line for a sinister-sounding amusement-park ride. Daniels presents blue-collar culture both in and out of the workplace, showing its profound influence on the lives of workers and their families. As in Places/Everyone and M-80, Daniels uses his character Digger to show the effects of work on outside life, following Digger into retirement from his factory job and into his struggle to find a new future. In addition, Daniels deals frankly with the specter of urban violence that haunts the community and threatens to tear it apart. Local heroes, from professional wrestler the Sheik to the contemporary rapper Eminem, also appear as touchstones for the community's complex view of itself.